These example sentences are selected automatically from various online news sources to reflect current usage of the word 'downstream.' Views expressed in the examples do not represent the opinion of Merriam-Webster or its editors. Send us feedback. Downstream refers to the benefits (or costs) that will ultimately result from decisions made today. In finance, a series of investments might be made with the anticipation that at a point in time in the future these efforts will yield a series of returns. These returns occur after the initial investments. As a result, they are referred to as downstream benefits. Similarly, investments can have downstream "costs" as well. The expectation is that the downstream benefits will outweigh the downstream costs. At the same time, because the future is hard to predict, downstream effects are often unanticipated, setting off unintended costs and consequences. 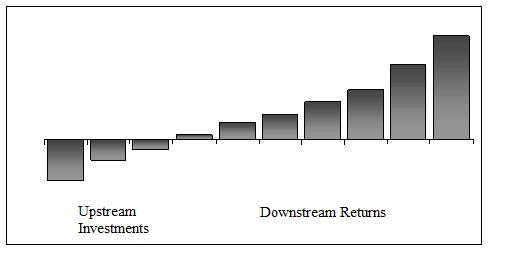 It is important to consider the "downstream" effects of an investment decision since it will impact ones future economic performance. What made you want to look up downstream? Please tell us where you read or heard it (including the quote, if possible).